I saw a great quote on Twitter yesterday. That’s what I want from my media experiences. It’s what all of my favorite films, books, games, and musical performances have in common. It’s those moments of breathlessness; the moments of the “Oh-My-God!”s; the moments when your heart fills with intense joy and awe; the moments that make you feel it was worth living just to have that one specific experience. I believe the goal of an artist should be to inspire those moments in your audience. I want you to change my life. If you do, I will evangelize on your work for the rest of my life. I played some WildStar F2P PTR for a little bit. I have mixed feelings about the flow of the reworked tutorial sequences. I like the addition of a very basic movement tutorial. I didn’t like how they gutted the Arkship tutorial, as there is already a skip tutorial option for more experienced players. It made the Arkship sequence feel very disjointed. I poked my head in the cash shop windows, but didn’t spend too much time with it, so impressions will have to come at a later date. I also continued on The Longest Journey. And oh boy, does it feel like one. After switching to Windows 10, the save button and the quit button are glitching on me. I can hit enter to confirm the save with the pop-up window, but I’m not able to quit using Enter, or with the mouse. The only way I can do it is to close it through the Task Manager. Because of this, I ended up doing something where I thought I lost all my save data. Thank the heavens for animation skipping in this game. I got caught up in about half an hour. Seriously, this game is like an audiobook in game form. The dialogue can stretch for minutes at a time. Don’t play this when you’re in a hurry. Maybe have something to do while listening to the conversations. You might fall asleep otherwise. I hope the sequels do a better job of separating dialogue into shorter chunks. This one’s got no guitars in it. Just a couple keyboard instruments and drums. I went for simple and cute. Day 15: He Shoots, He “Scores”!? This past week, both my exercise and blogging has been pushed back later and later in the day. I used to exercise when I first woke up before heading to work. When I started the Blaugust challenge, I would write the night before and schedule it to post in the morning. Then, it got pushed back to after getting home from work. Now it’s before bedtime. Let’s bring it back! It’s the weekend – the best time to make a schedule shift. I love gaming. I love music. I love writing. I feel like music and writing share a lot of the same brain-space in terms of harnessing creativity and communicating ideas. Visual art is probably the same, though I have little experience with it. 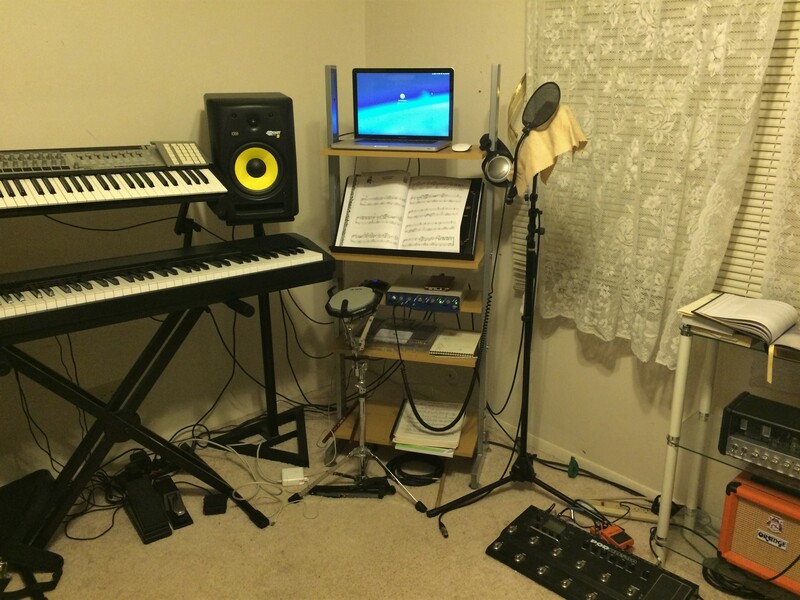 Since high school, I wanted to make music a career. I even started to have the mindset that if I wanted to be a serious musician, I need to be be able to enjoy all sorts of music and not shun any particular genre just because it’s not the cool thing, or it’s the devil’s music, etc etc. I took music theory classes. I started practicing violin on my own (gasp), and even sought out a part for guitar in the musical, “Crazy for You”. I’ve been studying and playing music ever since for the goal of working in the field. I love music. At this point in my life, I’m not sure I want to work in the traditional music industry anymore. Gigging locally is tiring enough as it is. Writing pop songs? Jingles? Setting up and running PA systems? Not sure it’s the right direction for me. But wait! I love gaming, too! I’ve loved video game music since back in the NES days. As a teen, I’ve daydreamed with friends about how cool it would be to be able to make video game music ourselves. Back then, it seemed like such a far-fetched dream. The thing is, it’s not a dream anymore. With the acceptance of gaming in the mainstream culture and the proliferation of indie game development, now is the perfect time to do it, and it’s well within reach. I just need to work on my craft. It’s time to get it up to speed. Here is my progress on my track a day Music Challenge so far. Track 3 will come on tomorrow’s post, as I’m writing this the night I finished number 2. So here’s a continuation of last night’s Music Challenge. It’s starting to solidify in my head. I have a basic template set up on my recording software with these tracks: Drum Sampler / Guitar 1 / Guitar 2 / Bass. Choose from one of the preprogrammed drum grooves. Compose and record a short guitar riff over it. Record a second and/or third guitar part over the first. A very basic mix before exporting the file. After a while, the workflow should become second nature and I can start to experiment a little at a time. Speed is key. Just like with sports, a musical instrument, or twitch gaming, the more focused practice you put in, the faster you will get. I need to get myself to a place where I can start monetizing my assets.